‘If the appalling stories we are reading turn out to be true, they are fundamentally incompatible with our values,’ says UK foreign secretary. What is Harvard trying to hide? For years, reporters have been trying to get elite universities to be more transparent about their admissions process. It might take a court to pry it all open — with unforeseen consequences. President Donald Trump said US would abandon the Intermediate-Range Nuclear Forces Treaty. President Donald Trump said the US would abandon a Cold War-era arms treaty. Dozens of candidates have cast their opponents as national security threats with ties to terrorism. The challenges and opportunities of the current e-economy. Why the connectivity revolution needs a globally ambitious industrial policy. Members of Congress are not buying Saudi Arabia’s explanations, nor are they pleased with the US response so far. Country will decide Friday whether to make another constitutional change. The party has limited appeal across the Continent and shuns alliances with liberals or socialists. For Dutch leaders, talk of a top EU job usually means only the end of their careers at home. The vote heralds a fierce contest for European and parliamentary elections in 2019. Germany also criticized Donald Trump’s decision, while the UK backed him. German chancellor says there’s ‘urgent need for further clarification’ in journalist’s death. ‘We’re not going to let them violate a nuclear agreement,’ president says. She’s not going away — and Democrats aren’t sure what to do about it. German chancellor calls for transparency from Riyadh. The Pentagon chief’s widely expected departure is fueling anxiety among officials of both parties who have viewed him as a force for stability. Sanctions are a blunt instrument. Here’s what the US can do instead to hold Jamal Khashoggi’s killers accountable. The state also arrested 18 Saudi nationals suspected of involvement in Khashoggi’s death. Can the oil threat spare Saudi Arabia from America’s wrath? Threatening a price hike might work in the short term, but it would come with serious costs to the kingdom’s reputation as a moderating influence on oil markets. Ruling comes just two days before local elections seen as key test for ruling party. The real concern is inequality. Prime Minister Giuseppe Conte calls Cabinet meeting to try and smooth things over. Local polls set stage for European and parliamentary votes next year. UK foreign minister says allegations over the disappearance of Saudi journalist Jamal Khashoggi, if true, would be totally unacceptable. The US Consulate General effectively functioned as a direct point of contact for the Palestinians. The US ambassador to Germany met with officials at the White House last week to discuss the job, according to administration officials. ‘It’s very sad. Certainly looks that way,’ says US president. Summit steers clear of conflict, but tough challenges from Brexit to the Italian budget loom large. Russian president appeared to compare case of Saudi journalist with that of Sergei Skripal. Hungarian PM falls into line with other national center-right leaders. Italian deputy prime minister says he’s eyeing up Jean-Claude Juncker’s job. The party lost its absolute majority in Sunday’s Bavarian election. Khashoggi was allegedly killed inside the Saudi Consulate in Istanbul. A large contingent of his 2016 campaign staffers is wary of a Sanders sequel. Some 20 years after liberalization, the EU’s electricity market conditions are completely different from those at the start of the century. Competition brought more efficiency, as well as new challenges for today’s market players. ‘We have asked for it if it exists,’ the US president said. Nikos Kotzias reportedly falls out with the defense minister, who also opposes the Macedonia name deal. Flemish parliament president said Spanish response to Catalan crisis showed country cannot be ‘part of a modern democratic’ EU. Ex-Finnish prime minister promotes EU values in pursuit of conservative nomination to be Commission president. The social media platform says the 10 million tweets show the full scope of foreign influence operations dating back nearly a decade. 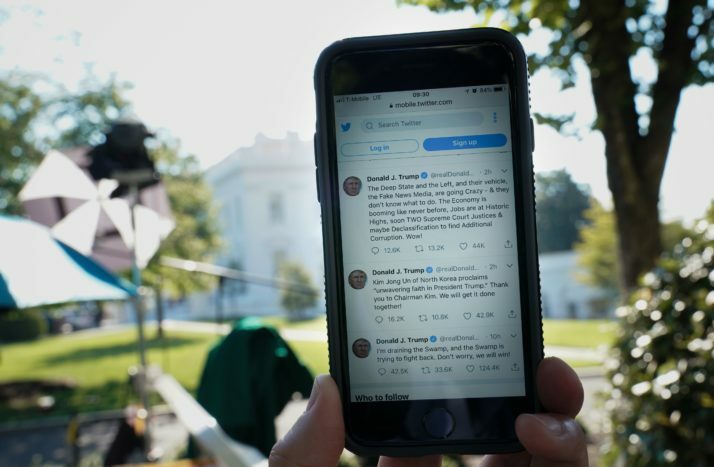 WASHINGTON — Twitter on Wednesday released a trove of 10 million tweets it says represents the full scope of foreign influence operations on the platform dating back nearly a decade — including Russia’s consistent efforts to disparage Hillary Clinton and an initially erratic approach to Donald Trump that eventually settled on a concerted pro-Trump message during the 2016 campaign. The huge data cache consists of tweets from some 3,400 accounts tied to the Kremlin troll farm known as the Internet Research Agency and 770 others linked to Iran. It also includes some two million gifs, videos and other visual content. Twitter said it’s making the information available to “enable independent academic research and investigation,” according to a company blog post. The Russian tweets around the 2016 presidential election showed distinct patterns when it came to Clinton and Trump, according to researchers at the nonpartisan Atlantic Council’s Digital Forensic Research Lab, which has been scouring the data since late last week. While the Clinton animus was clear from the start, it took the IRA a while to settle on its Trump strategy, as the Republican primary played out. He described “peaks and troughs — a lot of pro-Trump content and a lot of anti-Trump content” in 2015 and 2016, adding that Trump’s Republican rival Senator Ted Cruz (R-Texas) got a similar mixed treatment while former Florida Governor Jeb Bush was the target of negative content. But Nimmo said the messaging around Trump turned decidedly in his favor around the time the reality show star began locking up the Republican nomination. Nimmo said the Atlantic Council’s research into the data is still in its early stages, but he said it’s clear that much of the U.S.-focused tweeting was aimed at simply fomenting discord around political and social issues, a dynamic similar to what’s already been identified in Facebook ads and highlighted in Mueller’s indictment of Russian nationals and entities over 2016 election interference. Twitter and Facebook have been widely criticized since the 2016 election for not doing more to stem the abuse of their platforms by Russians and other foreign actors hoping to manipulate the American political landscape. Some lawmakers on Capitol Hill say the companies have failed to do proper post-mortems of that interference, including via digging into the enormous stores of online data they alone hold. The newly released Twitter data may eventually shed light on the style as well as substance of foreign campaigns. Russian accounts appeared to be particularly good at building personality into their tweets, such as those published by accounts like @TEN_GOP and @Jenn_Abrams, the Atlantic Council researchers found. By comparison, the Iranian operation was “much clumsier and clunkier and less engaging,” focused mostly on getting users to click on government propaganda, Nimmo said. The Twitter database is not limited to U.S. influence operations. Many of the Kremlin-linked tweets are in Russian and appeared aimed at shaping politics in Russia and Ukraine, according to Nimmo. London gets a Playbook. Politics and policymaking in the UK capital, written by Jack Blanchard. A weekly intelligence and analysis newsletter on money and lobbying in the EU capital. Former UK deputy prime minister makes surprise move to Facebook. The former UK deputy prime minister will move to Sillicon Valley in January next year. EU summit shows capitals are divided on how to counter a growing cyberthreat from Moscow. Some call the conclusion a missed opportunity.